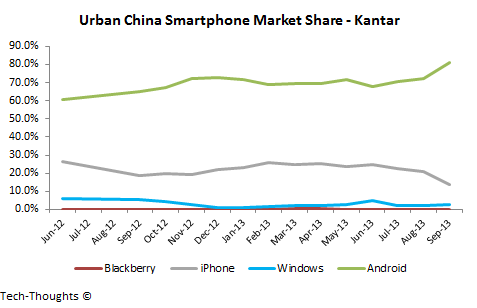 It's time for my quarterly recap of smartphone market share trends by region. 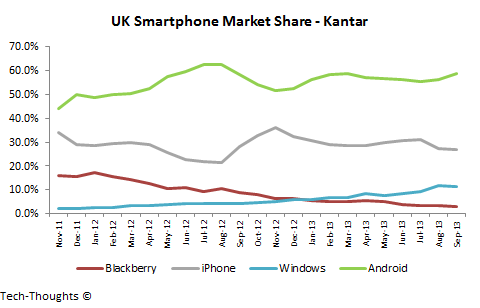 As usual, global sales figures are from Gartner, while region-wise market share figures are from Kantar. In Q3, Android continued to lead the market, the iPhone saw a cyclical decline leading up to the iPhone 5C/5S launch and Windows Phone continued to grow at a smaller scale. 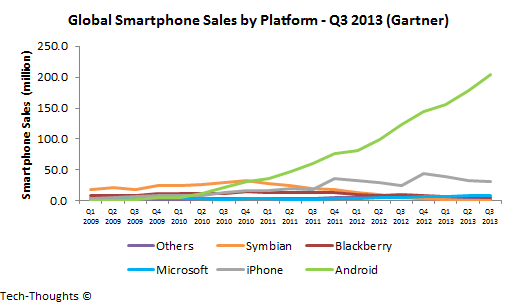 The chart above shows Gartner's global smartphone sales (sell-through) estimates. Nearly 82% of the 250 million smartphones sold in Q3 ran on the Android operating system, while iOS and Windows Phone represented 12% and less than 4% of the market, respectively. Android recently became the fastest platform to reach 1 billion users and has yet to register a single sequential, quarterly decline in smartphone sales/shipments. This speaks volumes about its ability to continually reach lower price points by reducing barriers to entry for OEMs. Interestingly, Nokia & Microsoft have attempted to use the same, low price strategy to spur Windows Phone growth. While this has resulted in sales growth, their cost structure remains too high to sustain this strategy. The US continues to be the iPhone's strongest market, and is highly cyclical like all iPhone-centric markets. Over the last couple of years, the Android platform has held a narrow lead over the iPhone, except in the holiday quarter. Interestingly, this year's September iPhone decline was slightly sharper than expected. This could either be caused by greater than expected pent-up demand for new iPhones or a sign of saturation in the high-end smartphone segment. Smartphone market share patterns have been remarkably stable this year, compared to the cyclicality noticed in previous years. Android currently holds a 58% share, while iOS holds 27%. Meanwhile, Windows Phone has registered strong gains and now holds more than 11% of the market. 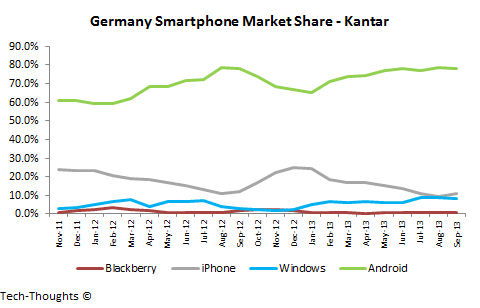 The German smartphone market is increasingly mirroring the patterns seen in Spain and China. The iPhone has registered YoY market share declines and now holds just 10% of the market, with Windows Phone trailing by just a few percentage points. Meanwhile, Android runs on nearly 80% of new smartphones sold. 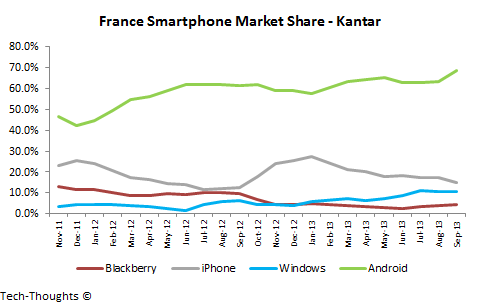 The Android platform holds nearly 70% of the French smartphone market, with Windows Phone now up to 10%. Windows Phone's gains mostly came at the expense of the iPhone, which saw a strong cyclical downturn to 15%. 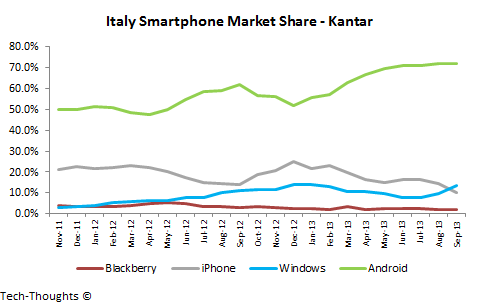 Android has continued its strong YoY performance and now holds more than 70% of the Italian smartphone market. Windows Phone's MoM declines are now a thing of the past as it overtook the iPhone in September. 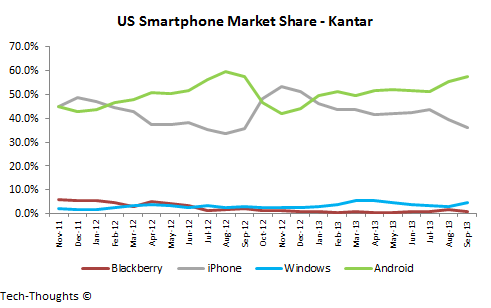 Windows Phone now holds nearly 14% of the market compared to the iPhone's 10%. 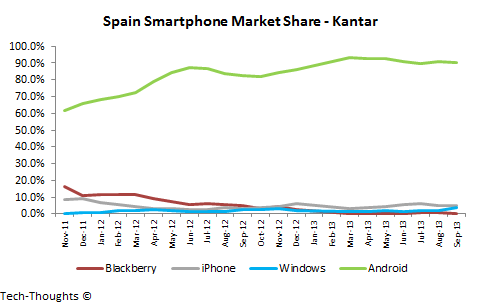 The Spanish smartphone market has remained remarkably stable over the past year, after Android achieved the 90% share mark. All other platforms have been relegated to the background, with both the iPhone and Windows Phone holding less than 5% of the market. 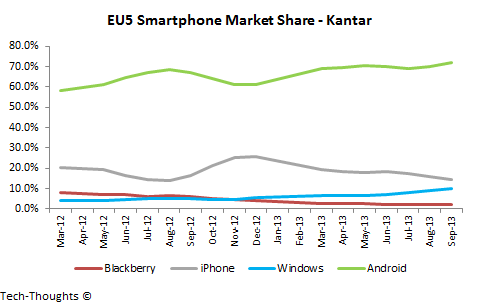 Overall, the Android platform is still gaining share in EU5 nations and now holds more than 70% of the market. The iPhone has seen a slow decline after last year's launch and actually saw a YoY decline in September. Finally, Windows Phone continued to gain ground thanks to the Nokia brand and its low-cost strategy. However, both competitive drivers may be at risk after the Microsoft acquisition. 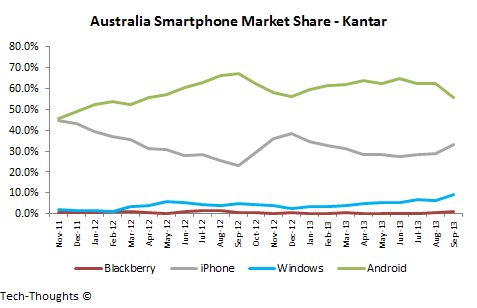 Australia has traditionally been another very strong market for the iPhone. This year, the market seems to have broken the usual cyclical pattern. September showed an unusual spike in the iPhone's market share, which may have been caused by the iPhone 5C/5S launch. It is unclear why the launch in Australia was so much stronger than those in other regions, but this may be something to watch going forward. Urban China has traditionally been a fairly strong market for the iPhone, but it showed unusual weakness in the months leading up to the iPhone 5C/5S launch. Android made strong YoY gains at the iPhone's expense and now holds more than 80% of the market. There have been some suggestions that this was caused by the unexpectedly high price of the iPhone 5C. Given the growth seen by companies like Xiaomi, I find it hard to disagree. 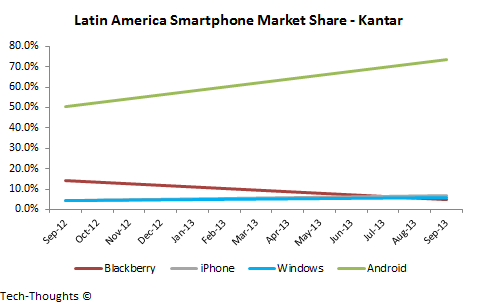 Smartphone market share patterns in Latin America, including Mexico, Brazil and Argentina, seem very similar to those seen in Spain last year. In general, price sensitive markets skew heavily towards Android and that pattern is very clear in the chart above. Windows Phone's market share seems to be keeping pace with overall smartphone sales growth, which isn't all that bad considering the low penetration in this region.